FairBot is state of the art Betfair Trading Software which provides an enhanced betting interface to the leading Betting Exchange, Betfair. FairBot considerably enhances the services provided by Betfair through the incorporation of real-time price movement charts, market analysis, information displays and trading tools. All of this combines to deliver a level of service currently unparalleled in today's on-line betting environment. It allows you to place single bets, or trades, on Betfair instantly, using just one mouse click. There is no need for waiting, no bet confirmation or changing of prices or amounts, although these facilities are there if required. Fairbot's wide range of sophisticated features will give you an enormous advantage over other Exchange Users and should enable you to turn that advantage into a profit. FairBot lets you to refresh the event information, including the odds, every 0.2 second to stay on top of the market. For betting exchange traders FairBot offers so called "Smart Bets" that allow you to trade on Betfair with ease and the maximum possible speed. Using "Smart Bets" FairBot generates the required bets to make a profit, (if matched), regardless of the result. The simple and easy to use Windows XP & Vista-compatible interface is very similar to Betfair which should make your betting comfortable and profitable. All the odds cells are active (rather than just two middle columns on Betfair) giving you additional flexibility for your backing and laying. The Ladder Interface - This allows the user to display prices vertically, and instantly react to market movements by placing or cancelling a bet with just one mouse click. "Keep bets" support. This allows the user to have unmatched bets automatically transferred to in play bets. 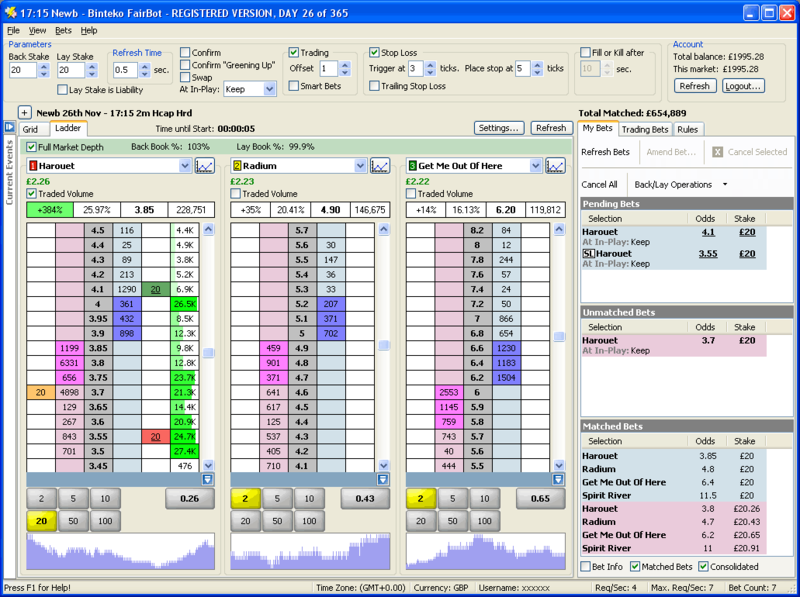 Ability to refresh any event to as low as 0.2 second intervals, much quicker than Betfair itself. Stake buttons for the Ladder interface, including the NET button. 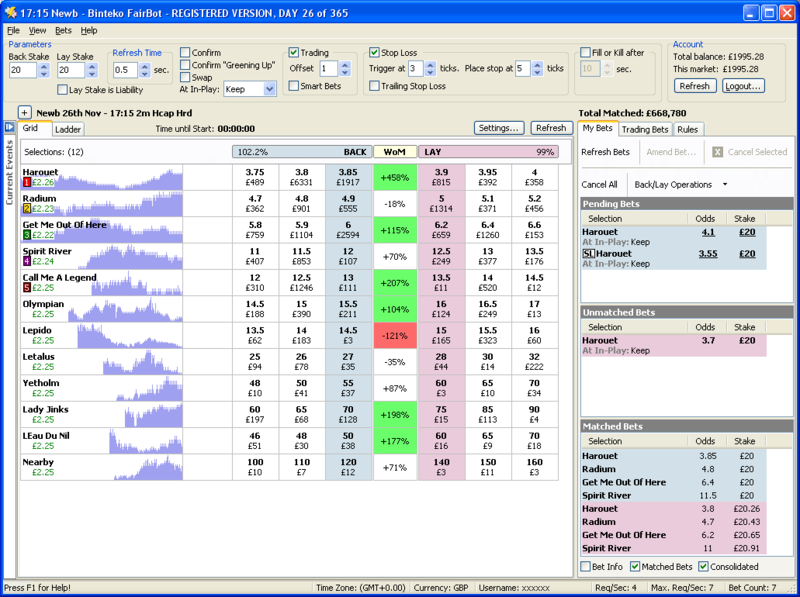 This allows you to set and use predefined stakes when betting or trading on the Ladder interface. Ability to place single bets or trades with only single mouse click. "Greening Up" feature - This allows you to equalize a current profit or a current loss across all selections. Price movement charts directly on the main screen for each contender. Advanced Charting. Candlestick, bar and line charts. 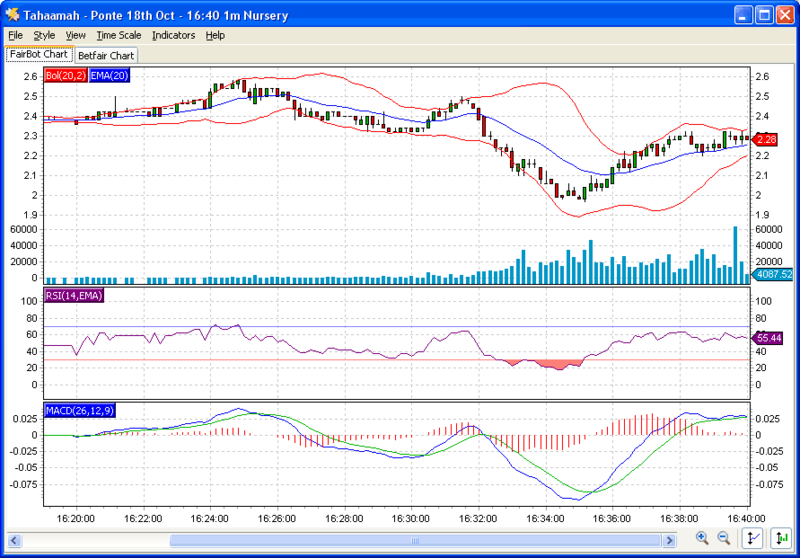 Various customizable technical analysis indicators like Bollinger Bands, SMA, EMA, MACD, RSI, CCI. "Fill or Kill" tool for single bets and for trades. It allows you to cancel unmatched bets automatically after a predefined number of seconds. Conditional betting - place opposite bet (Back or Lay) only if a previous bet was matched. Dutching feature (this is a technique for Backing multiple selections in the same event for an equal profit if any one of them wins). "Drag & Drop" feature for the Ladder - this allows the user to amend the odds of unmatched bets by dragging bets up or down the ladder. Set your own Back and Lay stakes and profit margin. Bet on any odds market, including "in-play" events. Ability to cancel all Unmatched bets using single mouse click. Optional bet confirmation and checking screens before and after placing bets. "Smart Bets" allow you to calculate stake to get maximum profit on your betting exchange trades. Display the 1st 2nd and 3rd Favourites as dictated by the market on Betfair. A countdown clock showing the time remaining before the scheduled start of an event. Full Betfair API support. This protects FairBot from any future changes made to the design of the Betfair web site. Ability to click on any odds cell rather than just the normal two middle columns on Betfair. We're offering this product and all future upgrades for a period of 12 months.